I was just flicking through 'Empire' (Oct 2006) and ... how can I put this? Han shoots first! 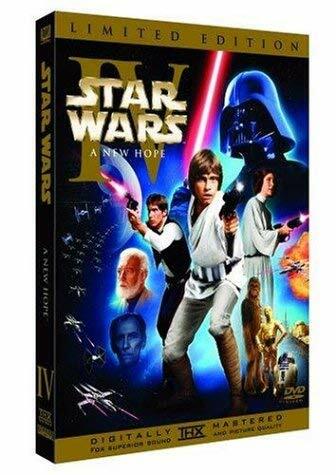 Contrary to what was said a few years back (that the original cuts of 'Star Wars' no longer exist), on the 11th next month there will be a new release of the films on DVD (Ep 4, 5, and 6). Each film will be a two disc set, the first disc will be the new and 'improved' versions. These are the versions with the mismatched special effects, redundant scenes with Jabba, daft numbers of Storm Troopers and Greedo getting what's coming to him. The second disc, the 'bonus' disc, will be the original versions, unaltered, dated but consistant special effects, Jabba saved for later, no batallion of storm troopers in the corridor for Han to run into, and Greedo being pre-empted by a smuggler. I think they may have got the numbering of the discs back to front, as far as I'm concerned the 'bonus' is the only reason to get this. I'm not at all impressed with all the reissues and upgrades, it got 'over fussy', and the mix of technologies used in making the 'upgrade' felt patchy. However, the original films on DVD.... tempting. The RRP of the discs is a touch under 23 quid each. A little on the steep side, especially when all I'd want is the 'bonus' disc. Unfortunately it'll be a letterbox edition and not an anamorphic version (i.e. better quality). Maybe that's for a later release (based on past evidence, not an unreasonable assumption). As for the future I'm not in any great rush to go to HD, primarily as DVD is 'pretty damned good', and my eyes won't see any further improvement! Amazon have them at more realistic prices right now, as I write a touch under 14 quid. There has been great controversy surrounding this release, however, since it has been revealed that the DVDs will feature non-anamorphic versions of the original, unaltered films based on laserdisc releases from 1993 (as opposed to newly-remastered, film-based transfers). Since non-anamorphic transfers fail to make full use of the resolution available on widescreen sets, many fans were upset over this choice. There is a piece regarding the quality of the release, on 'The Digital Bits'. It's been reported previously that when Lucas went back to the original negatives of the Star Wars films in the mid 1990s, they were found to be in bad shape. Such bad shape, in fact, that had they not been restored immediately, the films could have been lost forever. So restoration is exactly what Lucas had done. Except that when he was creating the new 1997 Special Edition versions of the films... he cut the original negatives. So the original negatives of the theatrical versions no longer exist. Okay, we knew that. But what's the big deal? What about the original interpositive prints? What about high-quality release prints? Why can't Lucasfilm just use either of those elements to do a new transfer for DVD? Well... at the same time as he was preparing the 1997 versions, Lucas apparently went on a little tear and recalled every release print of the theatrical versions that he could get his hands on, and he had them all destroyed. Which means that when Lucas said back in 1997 that the original theatrical versions of the Star Wars films no longer existed, he was serious. He apparently tried hard to make sure of it. Nonetheless (and thankfully), we know for a FACT that beautiful dye transfer prints of the original versions of the films still exist in private hands, and that additional copies are preserved in a number of film archives around the world. What's more, Lucas would have been foolhardy if he didn't keep the original interpositives carefully stored in a climate-controlled vault for preservation's sake. Come on... of course he did. No one is THAT stupid that they'd just trash all the original elements of the films that made them rich beyond the dreams of avarice. I'm thinking '30th anniversary' would be the time when good quality negatives/prints are 'discovered'. Wait much longer and Lucas won't be around to see it... or maybe he dislikes the originals so much that he doesn't want to be around when they get a decent release? The dilemma... wait for a good transfer (which may never come) or get this inferior transfer?